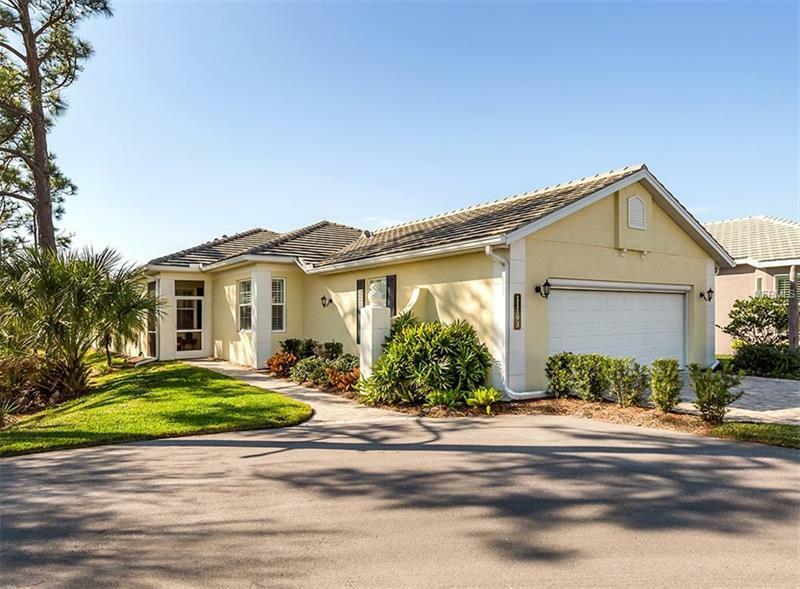 Like new, Maintenance Free Home in The Plantation Golf and Country Club with a stunning lake view. This 2 Bedroom, 2 Â½ Bath plus Den is located on a quiet cul-de-sac and loaded with upgrades. Tray ceilings, bay window, Plantation shutters and the thoughtfully designed floor plan create a bright and airy ambiance. Enjoy the spacious eat-in kitchen featuring granite countertops, a breakfast bar and built in ovens. The great room leads out to a beautiful extended lanai where you can enjoy brilliant lake view sunsets. The entire home is tile except for the laminate in the den. The spacious Master bedroom has two walk-in closets. The split floorplan provides your guests with plenty of space and privacy. Lots of extras here, an oversized garage with screen door option and all of the windows are insulated/impact glass with roll-down shutters provided for the covered lanai to make the home storm ready. This is a single-family home with condominium ownership so everything is taken care of from the drywall out, perfect if you like to travel or just want to enjoy a carefree lifestyle. The neighborhood has an active clubhouse and two community pools. The Plantation Golf and Country Club is a master planned community with two championship golf courses, 13 Har-Tru tennis courts, fitness center, Jr. Olympic pool along with exceptional dining and activity programs. Becoming a member is optional. Additional Water Information: Beautiful long view of the lake from the lanai. Amenities Additional Fees: Membership to the Plantation Golf & Country Club is optional. Pet Restrictions: Confirm pet restrictions with association. Copyright © 2019 Mid Florida MLS. All rights reserved. The data relating to real estate for sale on this web site comes in part from the Internet Data Exchange Program of Mid Florida MLS. Information provided is for consumer's personal, non-commercial use and may not be used for any purpose other than to identify prospective properties consumers may be interested in purchasing. Winkler Realty Group participates in the MFRMLS Internet Data Exchange (IDX) program, allowing display of other MFRMLS broker's listings on this site. However may not include all listings currently available. Information is deemed reliable but not guaranteed. Information last updated at 2019-04-20 00:19:25.